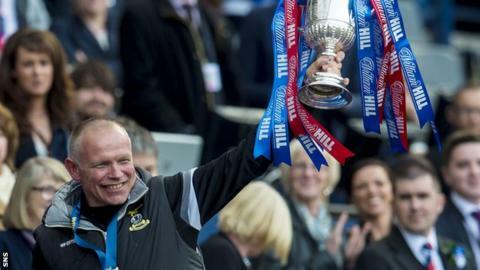 Inverness Caledonian Thistle boss John Hughes has told BBC Scotland he expects to make a decision on his future "over the next couple of weeks". Last season's PFA Scotland manager of the year is contracted until the end of the current season and discussions over a new deal are under way. Hughes, 51, won the Scottish Cup with Caley Thistle last season and says he has a number of things to consider. "[It's] right down to trying to recruit players and budgets," he explained. "That's all part and parcel of me staying at this club, 100%. "I'm quite sure there might be one or two players that are out of contract and want to see what the manager does before they commit. "But I'm honest enough to say this; I would never hold a gun to anyone's head at Inverness to say, 'I want to make sure that this is the budget next year'. "I knew when I came up here I was working with the budget I was working with. It's never changed. "It's just before you sign that contract just getting to know exactly what tools you're working with next year. I don't want to sign a contract and something gets taken away. "I have to speak to my wife and family. I've been away for a long, long time and that's a big part of it as well but I love it up here." Formerly in charge of Falkirk, Hibernian, Livingston and Hartlepool, Hughes replaced Terry Butcher at the Caledonian Stadium two years ago. And he guided the Highlanders to their first ever major trophy in May's Hampden final against Falkirk. A third-place Premiership finish and maiden European campaign attracted an approach from Dundee United, which was blocked by Inverness chairman Kenny Cameron. However, it has proved difficult to replicate that form with key departures and significant injury problems limiting their progress this term. They are currently ninth in the table and were knocked out of the League Cup by local rivals Ross County on Tuesday. "I'll always be grateful and thankful for the opportunity to come up here and manage this club," Hughes added. "We've had fantastic success. "We're going through a wee sticky patch but we can get out of it. "I cannot influence that, I've not got any control over it and I've no control over anyone getting injured. "I just look at what turns up on the training pitch and try to give my best to these guys and try to make them better. "What you need to do is get yourself on a run and we're good at that. We're going to have to do that with the boys that are available."